I used to have this completely unwarranted sense that I was invulnerable to falls. Not that I didn’t provide ample opportunity for falling while brushing second-story peaks, or rope-hauling chain saws up to tree-notch platforms. My sense of invulnerability hardly showed a crack even when my friend Bill fell while trimming the upper reaches of a tall hedge and landed on a sharp limb he’d lopped off just minutes before. Glad to say it wasn’t serious -- he only skewered a muscle in his back. And generally, Bill keeps his shirt on, so you don't notice anything at all! It was simply a matter of time before I came crashing down. And in doing so, I gained a new attitude about working on a ladder -- or getting on a ladder for any reason whatsoever! Lesson learned late, but learned. The problem was that I still had some high trimming to do. Not so much that I’d need to hire a tree guy, but enough that I'd need to work from a ladder. Would I fall again to the ladder’s siren song? Hardly! Enter the rental pole saw. In case you're unfamiliar with them, they’re basically a mini-chainsaw mounted at the end of a fiberglass or metal pole. 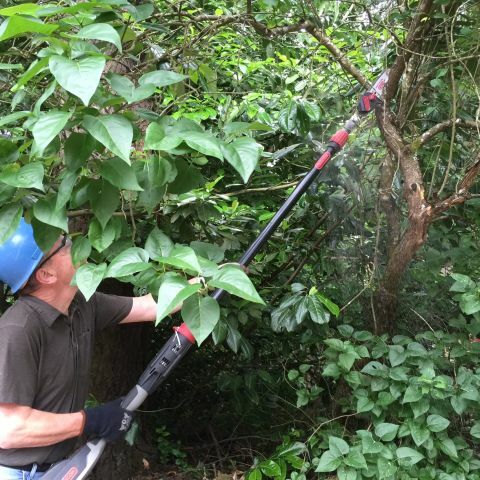 Pole trimmers are a similar tool, with hedge-trimming blade mounted at the top of the pole. 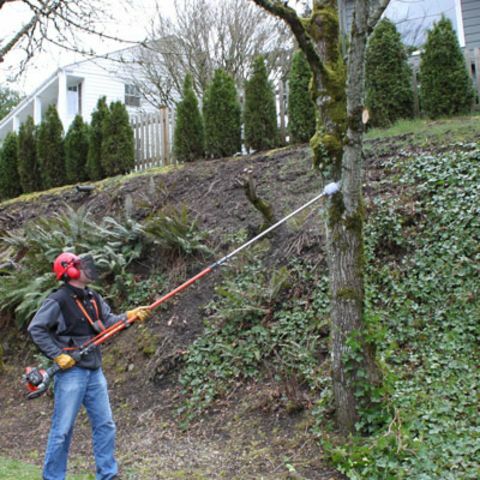 Pole saws and trimmers come in a standard fixed lengths with about a five or seven-foot cutting height. There also are adjustable models, like the one I used, which extend to a cutting height of 15 feet or so. Whether gas or battery powered, the engines on all are located at the base, like a reel on a fishing rod. By the way, cutting height means that’s how high the tool will cut if you hold it at waist- or chest-height. Oh boy, and if you got up on a ladder with a pole saw -- imagine the cutting height! Back to reality -- just because I'm through doing stunts like that, it doesn't mean I can't dream! While the pole saw's chainsaw is a mini, it was big enough to eliminate my need to use my standard chain saw from a ladder. That's more than a fair trade. In our case, we only needed the pole saw for two small jobs. One was to remove a couple of low-hanging limbs over our driveway, which formed a looming obstacle for anything bigger than a pickup truck. That, and a lilac bush that had grown into a tree, with all the flowers blooming 20 feet up -- which made it tough to snip flowers for the kitchen island! Lopping off the offending limbs over the driveway was a snap with the pole saw, and I worked the lilac down to a manageable height and size by using the pole saw for the high stuff, and my a regular saw for cuts I could safely make from the ground. If you’re looking at some high work, and think you probably could tackle it with a standard chain saw from a ladder, well, I’ll be thinking good thoughts for you. As for me, I’ll just play it safe with a pole saw!